iOS7 allows usb connection on iPhones! This exciting news for iPhone users kind of slipped out relatively unnoticed during the various hubbub surrounding the recent launch of iOS7. 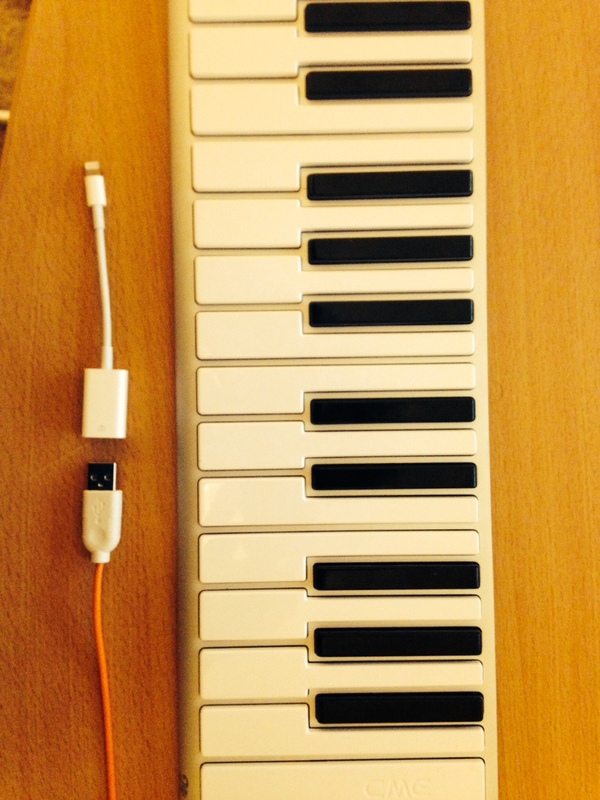 What it means is that you can attach a camera connection kit (CCK) to an iPhone and use it as a USB input for connecting midi keyboards and/or an audio interface. This is something that iPads have been able to do for a while but not iPhones until now. I think this is quite big news as it means you can now attach a class compliant device to your diminutive phone. Class compliant means that the device doesn’t need any drivers and will just simply work. Units that require drivers sadly won’t work as iOS doesn’t allow installing hardware specific drivers. A decent list of class compliant audio interfaces can be found here. Whilst here is a list of compatible midi interfaces. I have a CCK connected to an iPhone 5. Plugged in to that I have a newly released CME Xkey midi keyboard. This keyboard is quite special as not only does it feature (kind of) full size keys, it also supports polyphonic aftertouch. A holy grail of sorts to keyboard players, polyphonic aftertouch allows for each key after being pressed to modulate the sound independently from other keys, for instance differing vibrato rates or filter cutoff. Better quality keyboards have featured aftertouch for years but this is usually monophonic aftertouch meaning that if you applied aftertouch to one key, it would affect all notes played equally. A guitarist essentially does this when they apply finger vibrato during chordal playing. When applied to a keyboard, it really makes the instrument feel more organic, more alive. In many ways this really does open up the world of micro studios. I thought that iPad studios were quite minuscule but compare that to an iPhone running say Garageband with audiobus with a whole bunch of synths like Animoog, Modular, Alchemy, Cassini or Magellan Jr plugged into one of the tiny midi keyboards (QuNexus, CME X Keys) and you really have the most portable but very powerful synth rigs around!